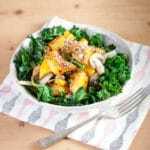 This vegan roast butternut squash salad topped with crunchy dukkah is full of colour, flavour and texture. Ideal as a light meal, or a side dish. When the butternut squash is cooked remove from the oven and allow to cool. Fry the mushrooms in a little more of the olive oil until soft, then add the spring onions and cook for another minute. Lightly cook the kale – I usually steam it in the microwave for a minute.